A pair of reports coming out of the Far East on Tuesday claim that Apple is looking to expand the screen on at least one version of the next-generation iPhone to 4 inches, while also adding an upgraded A5 chip processor to its smartphone offerings and an enhanced version of the A4 to the second-generation iPad. According to Taiwanese industry publication DigiTimes, upstream component suppliers report that Apple will expand the screen size of the fifth-generation iPhone to 4 inches in order to compete with a growing class of 'super phones' in the 4- to 7-inch range. 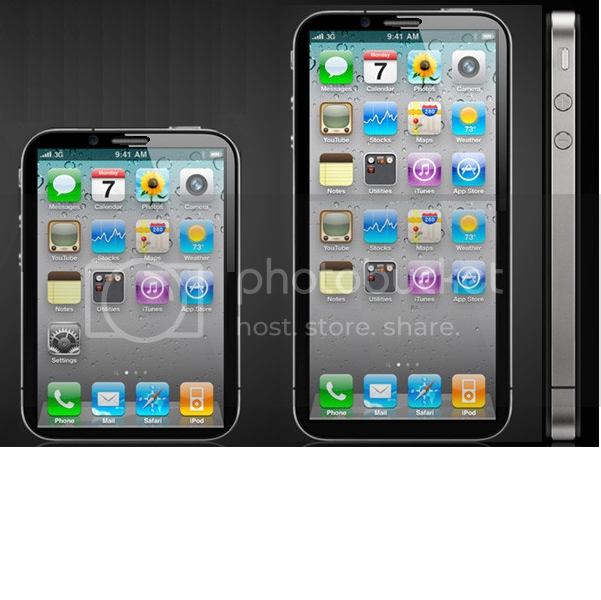 By comparison, the iPhone 4 sports a 3.5-inch display with a resolution of 960 by 640 pixels. The screen bump could also serve to push the iPhone toward the smaller end of the tablet market. "The component suppliers noted that the production lines for Apple's next generation iPhone have begun testing, and Apple is interesting in expanding the screen size to 4-inches to support the tablet PC market as the vendor only has a 9.7-inch iPad in the market," said the report. Google Android-based phones appear to be driving the screen race, the report noted. For example, the 5-inch Dell Streak, which has been called a "tweener," has been marketed as a competitor to both the iPad and the iPhone. If accurate, the DigiTimes report could dovetail with recent rumors of an "iPhone nano," as Apple may be looking to differentiate its iPhone lineup with bigger and smaller displays. Though rumors of a smaller version of the iPhone have persisted for years, recent reports from Bloomberg and The Wall Street Journal of an upcoming cheaper, smaller iPhone have lent credence to the rumors. A recent unverified report from another Taiwanese website claimed that Apple has built three prototype models for the "iPhone 5," including a version with a "sliding cover" that conceals a keyboard. A second report from DigiTimes claims that Apple is hoping to outsource the production of its A4 processor and the next-generation A5 processor, which will likely utilize the ARM Cortex A9 design, to Taiwan Semiconductor Manufacturing Company due to concerns over increased competition between Samsung and Apple. At this week's Mobile World Congress, Samsung has shown a number of new products, such as the Galaxy S II smartphone and the Galaxy Tab 10.1 tablet, that will directly compete with Apple's iPhone and iPad. Though Apple's A4 processor is currently exclusively produced by Samsung Electronics, Apple has tapped TSMC for help producing the A4 in the past when Samsung's capacity was unable to meet demand for Apple's devices. Sources indicated to DigiTimes that "the move at that time was perhaps to test TSMC's capability." "According to Digitimes Research," the report continued, "the iPad 2 will support an enhanced version of the A4 and the A5 will power the iPhone 5. TSMC will initially produce the improved A4, and could likely become the exclusive manufacturer of the A5." The report echoes rumors from January suggesting that the next iPhone will run atop "Apple's new A5 CPU (a Cortex A9-based, multi-core chip)." DigiTimes, which bases many of its reports off tips from Asian suppliers, has a hit-and-miss track record with Apple predictions, so Tuesday's reports should be taken with a grain of salt. With all the iPhone rumors I knew it wouldn't be long before this one came up. Whats next the new iPhone is going to be running Android? With this, and the previous "story" about the new iPhone having a slide out keyboard, this day will go down in history as the day that AppleInsider jumped the shark. PS - You know your in trouble when click whores like 9to5Mac look sophisticated and intellectual compared to your site. Rumors are rumors, but if true.....fragmentation begins. At least two different screen sizes, maybe three if there is a nano iPhone. Plus the iPad's resolution. Hmmm. Doesn't matter to me, I am skipping this generation unless something awesome comes. LTE may convince me, but I'm not so sure it's ready for this refresh. No fragmentation for the iPhone - it will simply have a larger screen at the same resolution. The iPhone Nano is another story. I think this is a really bad idea. I can't believe that the company that gave us the amazing MacBook Air would make the beautifully slim and pocketable iPhone 4 into another oversized brick phone. What's next, a shorter battery life? I was thinking the rumours of an iPhone "nano" might be explained if the iPhone went to a 4 inch display and the "nano" had a 3 inch display. With an extremely small bezel it might not have to grow too much either. That said, I think it's more likely both rumours are nonsense. I did enjoy the claim that they need a bigger display "to support the tablet PC market as the vendor only has a 9.7-inch iPad in the market." Apple now needs to "support" a market where it's the only player? Since the bigger the iOS device is, the bigger the battery it gets - the answer is NO. I think it would be nice to have a slightly larger screen, not because other makers are doing it but because it wouldn't feel like such a confined UI. I'm pretty sure 4" can be done without making the device noticeably larger, the frame of the iPhone 4 is 5" diagonal. Clearly, you would have a smaller bezel but it can be done. Enhanced A4 for iPad 2? I hope not. Yeah, I agree but I had been thinking that the iPhone Nano would come in at some oddball resolution. If this rumor is true, it actually makes the iPhone Nano rumor both more likely and less of an issue with regard to fragmentation in my opinion. Once again, with these new "rumors". Shall I just upgrade on Verizon March 1st or wait until the new iPones come out...? This is hilarious! Slide out keyboards, nano iPhone and now Apple has to compete with the "super" phones. I'm just waiting for a Something like the BB scroll wheel. Maybe they have things backwards and the "iPhone nano" is actually the iPhone (3.5") which happens to be half the size of an intermediate phone/tablet (7') which would sit between it and the iPad (9.7"). There clearly is room for something between the 2. Both of these rumors, of a smaller iPhone and larger iPhone, will turn out to be about iPods. The iPhone UI won't work on a smaller screen (unless Apple includes sandpaper to make your finger pointy). And a 4" iPhone would not be big enough for the iPad UI, so you'd have no additional UI features than the iPhone already has. So what would be the point? The only option would be to create a 3rd (and even 4th) UI, which time and time again people here have dismissed as fragmentation and too much work for developers. So I think these rumors are about iPods. Today's iPod touch will become a little larger, but with the same resolution as today's iPhone/touch (so you can use the same UI). And the rumors of a smaller iPhone will really be the replacement for the iPod classic, finally retiring the last of the hard drive iPods. It will have a smaller touch screen than the current touch, but the UI will be stripped down to focus on iPod features. No internet/web/email, no applications (so no new dev kit needed from Apple), may or may not have a camera. The hardware savings of a lower resolution screen, less powerful processor and graphics, less RAM, etc, will be used to cram a lot of flash storage into it so it can replace the iPod classic. Though I do believe if they make a change this big - scaling up the screen, they will also do a new design with the whole phone. Get that antenna inside and put an end to "antennagate." And then what, you display the 50,000 apps already out there with letter-boxing and force developers to choose which aspect ratio to develop for? Or make them develop two UIs for every application? Minor letter-boxing like you get when you scale and iPhone app to full screen on an iPad is probably acceptable to Apple, but I really don't see them accepting the huge letter-boxing that would be required to allow the same app to work on both of the devices in your mock-ups. Ain't gonna happen. "Decoy flares are infrared countermeasures used to protect aircraft from being detected by infrared homing missiles, that is those that detect heat sources like a jet engine. Like a plane?s guardian angels, the flares create false heat targets that confuse the guidance system of an enemy aircraft?s infrared missiles." I can't wait to see some of the missiles fired by CE companies at Apple's decoy flares. It does sound like a dis-information campaign, doesn't it..